Off to Germany again, this time to cover freight lines in Nürnberg linking one of my few isolated bits of track to the rest of the (well, my) known gricing universe. As usual an assortment of new openings, reopenings, preserved lines and brewery taps went into the mix. 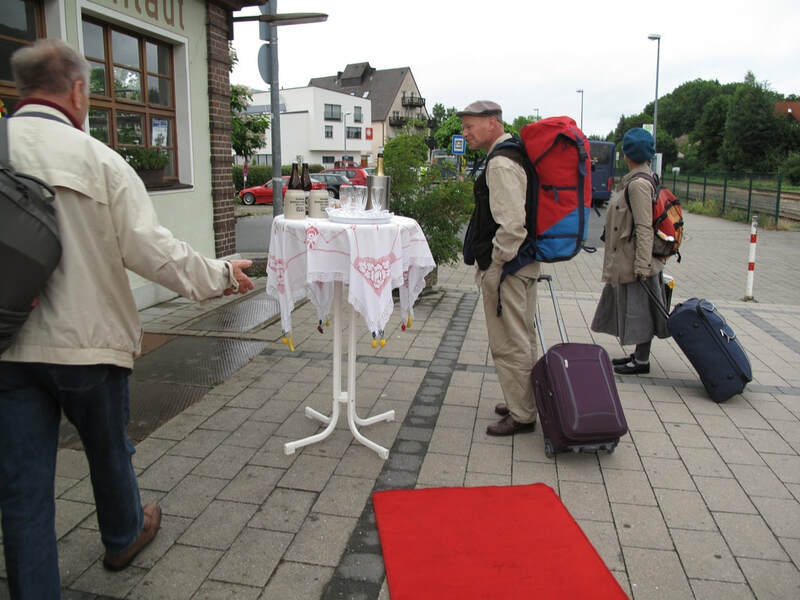 A red carpet welcome to Ebermannstadt on 10.7.14. Clearly I wasn't the only one bemused by it! A power controllers' strike on LU, though apparently ineffective, made me decide on an early start and an above ground route so I awaited the 06:53 Telford-Wolves in a distinctly non-bushy-tailed mode after a late night helping out with IT problems. Arriva turned up with two coaches instead of the booked four, ensuring that I had to stand to Wolverhampton. On decamping there I discovered I'd left a timing off my plan so made a sharp exit on 07:19 Four Oaks to be sure of picking up my Euston train at New Street. This I did, and was blessed with a seat all the way to London, unlike those who joined from Bletchley onwards. Arrival at Euston was on time at 10:18 but the need not to use any gadgets so that they'd be operational at Heathrow [at the time there was increased security requiring phones and tablets to be charged and demonstrably operable] made for a mightily dull ride once the Metro had been read. The flight pushed back more or less on time but after the usual lengthy wait to take off, arrived 10 minutes late at München. On the plus side it arrived at an air bridge and without hold bags or hire cars I was away on the S-bahn to Hackerbrücke in 15 minutes. A short walk to the Augustiner tap (easy to find - just follow the smell of malt and hops) which was absolutely heaving. I did manage a half litre of their not too exceptional pils though. By this time the effects of a very short night and a lot of travelling were kicking in so I decided to call it a night and made my way out to Riem on an S2. The Ibis Budget is only a few minutes walk and a cheery reception man booked me in and assured me Germany would win the World Cup on Sunday [rightly so, as it turned out]. Into the Ibis where the kindly receptionist booked me in a couple of minutes early. Then I foolishly did a partial unpack in the room before realising I'd probably miss the bus. Despite running I did, and pleading gestures to the driver while he was stuck at the lights were refused. Nothing for it but to try the other way. The bus arrived while I waited to cross the road but this driver was kinder and seeing me running up behind, opened the doors for me. And so to Hohe Marter Nord and S2 to Hbf, making the 12:41 RE by 4 minutes. Fortune favours the idiot once again. Then on to Bamberg, on one of a pair of 442s. I walked up into town rather than wait for a bus, heroically passing within metres of Fässla and Spezial on the way without actually going in. Studiously ignoring Schlenkerla and its rude service I went straight for Ambräusianum almost next door. Tried the pils this time - excellent, and staff to match. Thence by bus to Greifenklau, a pleasant grockle-free zone with a really superb weizen. On to Fässla then, nice people as before but the pils didn't seem quite as good as last time. The last port of call required doing (again) the branch to Ebermannstadt. This was worked by an Agilis kart. I'd forgotten to tell the electronic vademecum where Schwanenbräu was but a bit of local detective work found it easily enough. A very pleasant market town hotel, with a presentable weizen to round off an interesting day. Although I'd gained an hour on my original plan, an early start tomorrow motivated me to go straight back to the hotel from Nürnberg Hbf. Missing the 65 by 2 minutes at Frankenstrasse gave me an opportunity to watch it rain for 18 minutes. A much brighter day and a more orderly getaway from the Ibis to get the 06:21 bus, slightly late. U1 to Hbf for mayofast then on to Nordost on U2. The tour train appeared on time headed by maroon and cream 217 002 as booked. Plenty of room which made things much more pleasant. Leisurely progress round to Fürth then somewhat quicker to Bamberg though with a 15 minute stop at Forchheim. 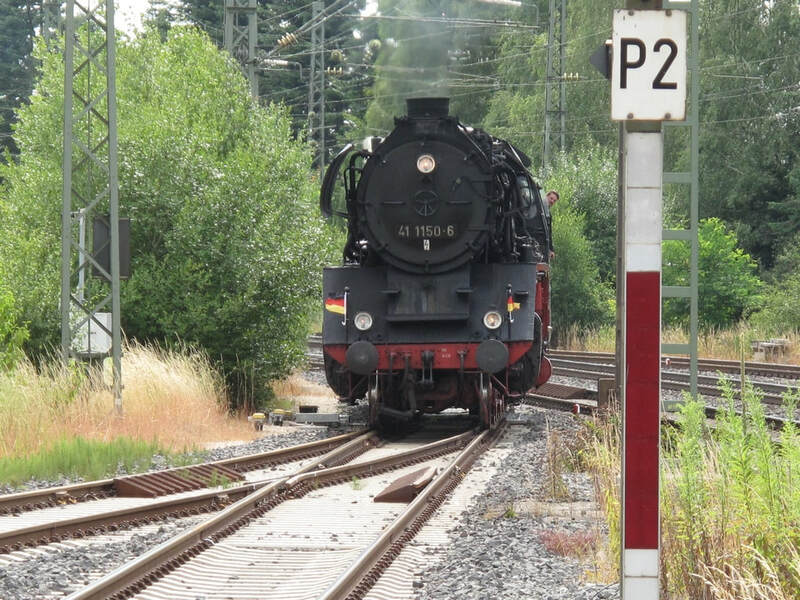 The Bamberg stop was over half an hour, departing at 09:45 for Oberhaid on the Würzburg line, where we stopped in a loop for the loco to run round. Thence via the Bamberg avoider on to the Lichtenfels line. Non-stop through Lichtenfels, possibly for the first time. Stadtsteinach definitely rates as a proper branch line. Very enjoyable 3-mile trundle through the countryside ending up at what appears to be a stone terminal of sorts. Half a mile or so to the Schübel brewery who seemed to have been caught unawares by our punctual, or even early arrival. They rallied round however and a very good spread was put on, accompanied/preceded/followed by as much beer as required. I confined myself to three - all bottled unfortunately so rating only an unfair A. A worthwhile thunderstorm arrived before we left but fortunately I'd made my way back to the train by then, looking in at the museum, but it required €4.50 for admission, and being a non-German reader I doubted I’d learn much. 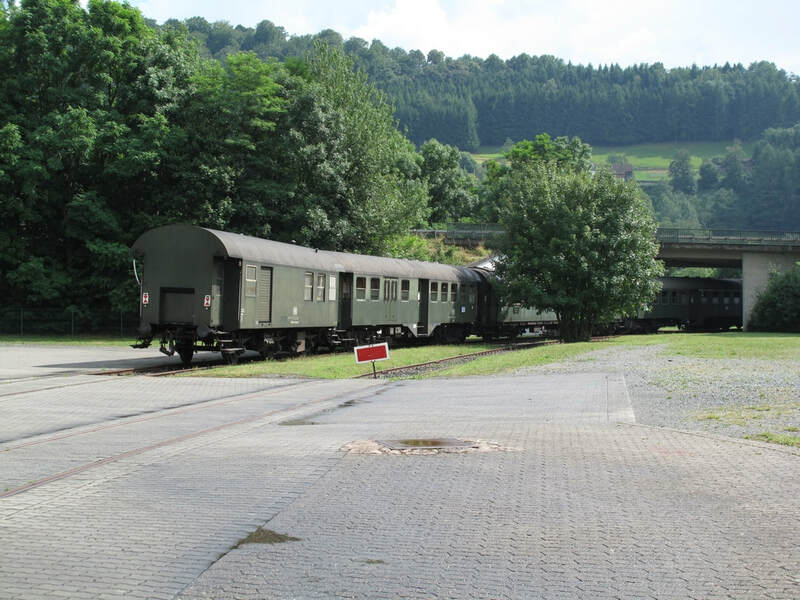 We left a few minutes early or late depending on whether you looked at the booked timings or what the train crew had asked us for, only to grind to a halt a short way past Kulmbach. There followed a tedious stagger most of the way to Lichtenfels which involved stopping at every level crossing, of which there are many. Eventual arrival at Bamberg was just over half an hour late but with very easy timings we got back to Nürnberg Nordost a couple of minutes early. An excellent day out which did what it said on the tin and deserves congratulations to the organiser whose 50th birthday was being celebrated, and his German counterparts. With a very early start in prospect I headed back to the hotel, this time missing the bus by 1 minute thus getting the opportunity to watch it rain for a further 19. 4 late at Münchberg but things improved and it was -2 at Hof so the +4 made, cross platform fortunately, and was only 1 late away. Dostos, working air con and a seat on the shady side - all good so far. By contrast the S-Bahn Mitteldeutschland karts which turned up on time from Halle were very much up to date, with the usual wide corridors and wretched seats. And toilets, bless 'em. 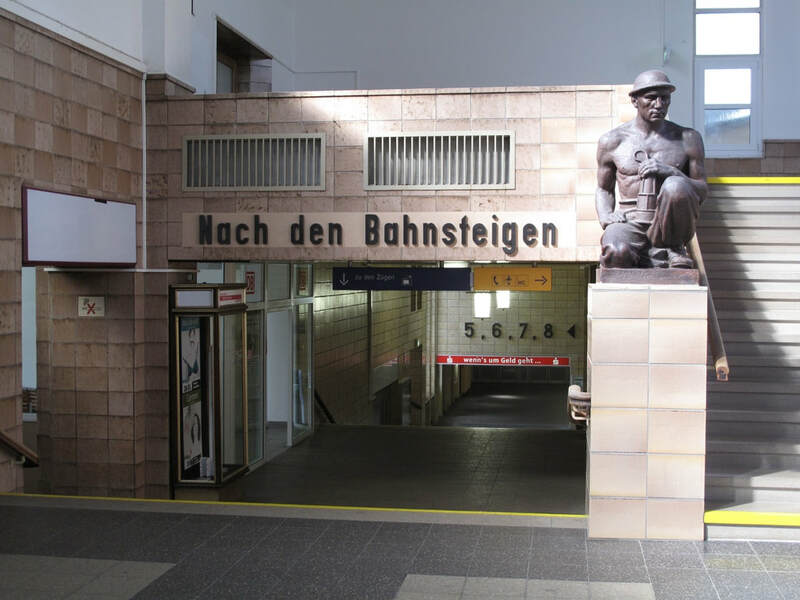 And so to Leipzig where I realised as we went on to the former Bayerisch Bahnhof line that there was a diveunder on the north curve. Not good news on an already tight schedule. First reaction was 'leave it for another time', next was 'see if I can busk it'. 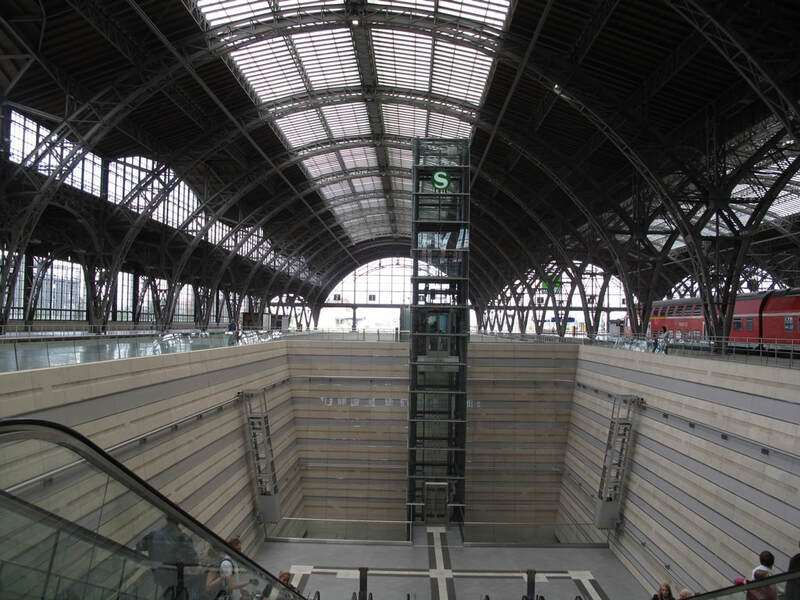 Instant change of plan rarely works so I carried on to Leipzig Messe and back. On return to L-Hbf I considered various options none of which seemed to work, and decided to stick to plan A and go out to Gohlis. 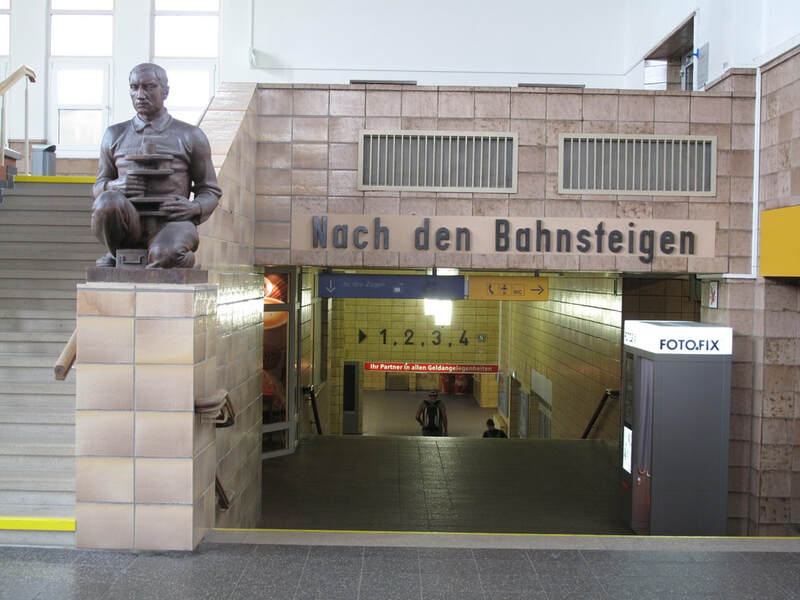 While there I checked Rail Planner which said I could get an S3 to Völkerschactdenkmal arriving at 12:35 and then continue at 13:15 to Engelsdorf, returning at 13:34 to L-Hbf in good time for the plan A 14:26 to Saalfeld. This even extended the proposed brewpub stop by 8 minutes. All good stuff, and off I went on an S3 for Stötteritz, diving out at Völkerschactdenkmal to find the next tram in 6 minutes and the return needing me to get back at 13:00 for the 13:15 train. Not good news. Nothing venture, so I got the tram to the brewpub, checking the display on arrival to find I had 12 minutes... Well, if need be I could go back an hour later. In I went, the place was busy and the bar person didn't speak English. Why should she, this is Germany. She summoned an English speaking waiter, I explained the situation, he translated, beer appeared and was consumed with great pleasure (a very decent unfiltered hell) and paid for and I made the tram with a couple of minutes to spare. Never thought it could be done, and all respect to Kaiser Napoleon for fantastic service and great beer. And there's more. As I now know thanks to Google, Völkerschactdenkmal is a memorial to the Battle of Leipzig. It's extremely impressive and well worth a visit. Next time I'll leave enough time for both that and Kaiser Napoleon! After all the excitement the run out to Engelsdorf and back to Leipzig Hbf was very straightforward. Erfurter Bahn produced 3 trapezoidal windowed SULFAs for a 2 hour journey, which is a bit underwhelming. 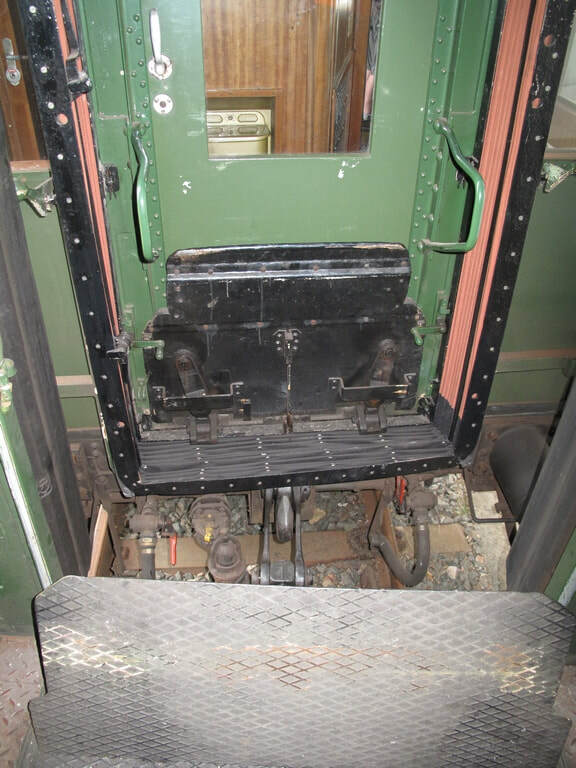 But it's wedged, and I've got a seat, and the air con works. Unfortunately there was 8 minutes extra time due to late running, but still time to queue up in the bothy at Saalfeld for a bottle of Saalfelder Pilsner which brings up the old refrain 'why can't British brewers make bottled beer like this?'. Sound as a pound, and cost just about that even with the pfand. The 16:54 RE to Erlangen and Nürnberg was delayed by 5 minutes or so due to late running of 16:47 IC to München so I'll probably miss my bus in Erlangen but that's no great drama. And in fact with a booked stop of 16 minutes at Bamberg there was no chance of missing the bus! 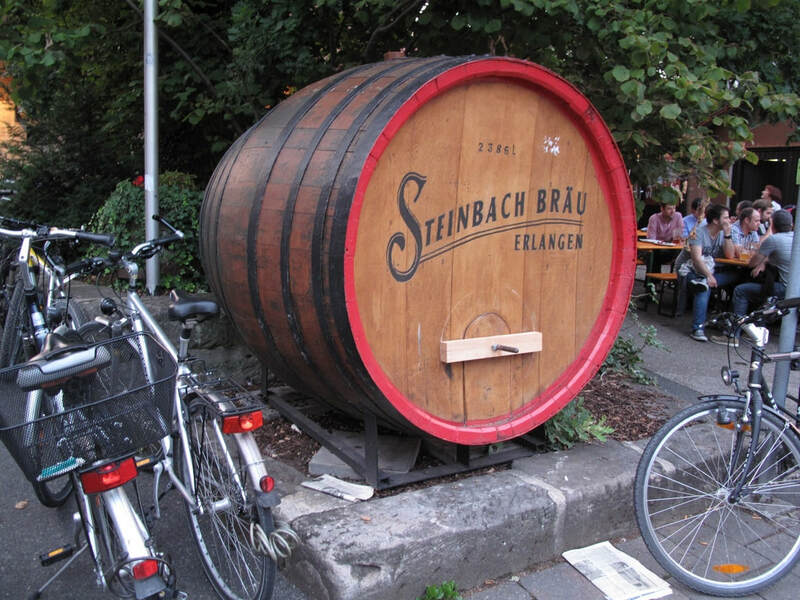 The Novotel is just two corners away from a bus stop so I checked in there and got another bus to the equally convenient Steinbach Bräu, a fine establishment a few steps away from Martin Luther Platz. Two beers on, hell & dunkel. I had the lighter, as ever - good call as it was well into the A+ range. A pleasure to be able to sit down for a proper breakfast, available from 6:30 even on Sunday. It did seem to have Sunday Bread Syndrome but perhaps fresher supplies arrive later. Away to the station on the 07:38 bus, and thence by RE to Forchheim for the Agilis kart to Ebermannstadt where the bahnhofsfest was just staggering into life. 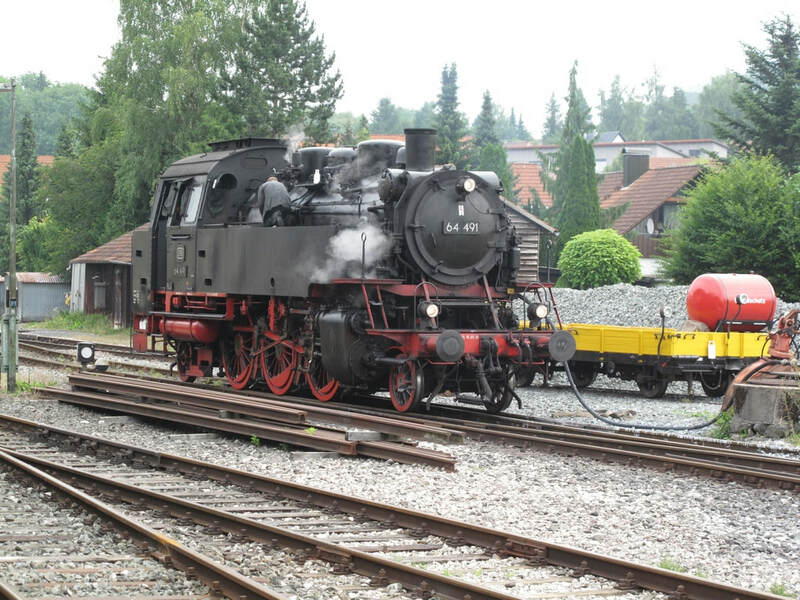 64 491 was very much alive and in due course hauled us to Behringersmühle. This part of the line is very scenic, in complete contrast to the normal passenger section. The run included another sample of Schwanenbräu which in all honesty doesn't seem to bottle all that happily. Despite apparent late running the timings were such that we made the connection at Ebermannstadt with ease and I continued from Forchheim to Nürnberg on an S1, during which I checked in / tomorrow's flight, and then on to Ansbach on S4. Food and drink (Kloster Scheyern Kloster Gold Hell) were taken there in case facilities are lacking at Gunzenhausen. In fact they were not. On arrival I was able to confirm from the sheets that the preservation trains were running. I had an hour to wait and a choice of sitting in a shelter on P2 or sitting outside the gastätte on P1 with a weizen from the mighty Gutmann of Titting. Not really a choice, in the conventional sense! The steam train turned up on time; unfortunately chimney first which meant photos straight into the sun - which had come out seconds earlier - and of course tender first to Nördlingen. Fortunately for me the Nördlingen trains leave from P2 on the east side of the main running lines then cross to the southbound main line from which the branch diverges. No problem with the physical connection, therefore. There followed an exhilarating thrash with speeds well up on anything on UK preserved lines. A number of crossings require manual operation and in fact we arrived a few minutes late. 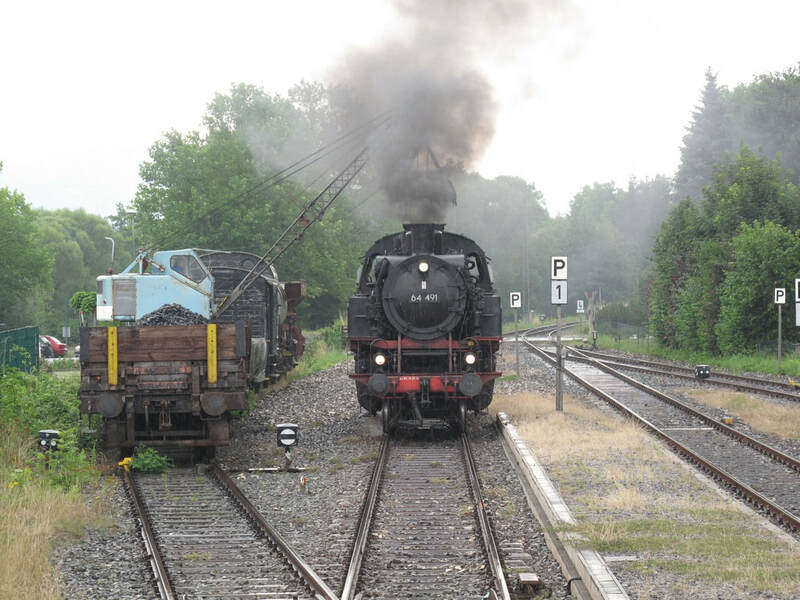 Lucky again; only the afternoon steam working is booked from and back to P7 but we ran into P5 which my connecting Donauwörth train also used. All good stuff. Lazy start today, with my flight due to leave at 12:55. After a sound night's kip (apparently the local side did well but I heard nothing) and a shower I was able to do justice to the Mercure's excellent breakfast. Most impressed by the first orange pressing machine I can recall seeing outside Spain. Deciding to vary the airport trip a bit I got the S-bahn west to M-Hbf and then 'above ground' transport in the form of a 19 tram to M-Ost, which was far more interesting than S8. From there on it was the usual S8 to Flughafen from the shiny rebuilt M-Ost. On arrival at around 10:55 I enquired how slow security was, and was told it was OK now but I should go straight there as there were two fully booked flights to the US imminent. On the basis of 'OK now' I decided to risk a quick visit to Airbräu and was served a 0.3l of Jetstream by a very pleasant and efficient young waitress. On return to the fray there was indeed a long queue for passport control but it only took about 10 minutes, and security only a couple. So all was well and with an early departure (and arrival at LHR) of a packed Airbus I was on the Piccadilly line platform at 14:05, just 5 minutes after the booked arrival time. The electronic immigration thingy read my passport this time, too. Over to Euston via Green Park, arriving just in time for the 15:13 LM to Birmingham - this was impeccably punctual so the +5 at Irrational on to the 17:09 ATW Llandudno made easily. At the time of writing 5 hours 3 minutes MUC-TFC looks a possibility. Which just shows you shouldn’t jump the gun. A 7 minute delay at Crane Street Jn resulted in a similarly late arrival at Telford Central where my long suffering other half was waiting with the car. With only a minor delay on the outward flight and an even more minor one on the final train journey, this was a very enjoyable trip. Above all it filled in that infuriating gap between Nürnberg Nordost and the rest of DB! Luckily for one who’s always happy to visit Germany there are still some lines either already reopened or on the way there so further visits remain a possibility. They may have to wait until 2015 though. They did indeed. 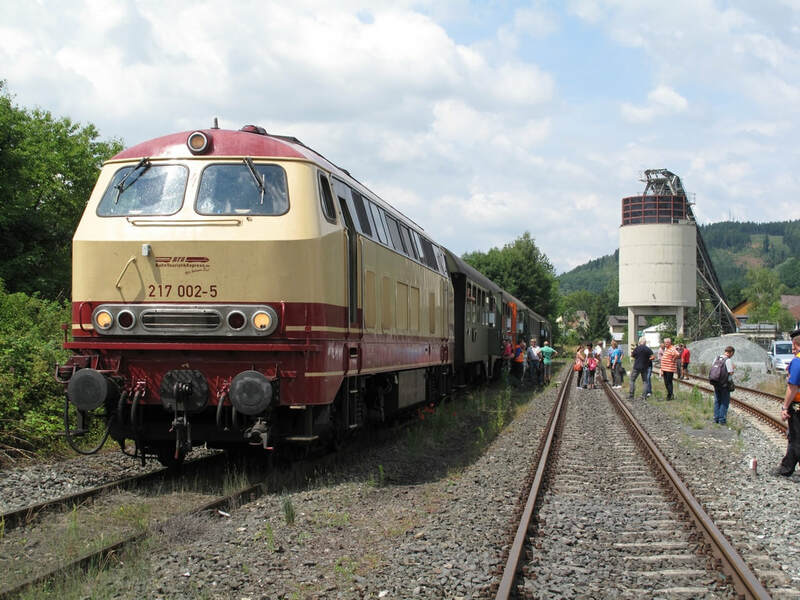 But on 5 July 2014 passenger services had been restored between Dolní Poustevna and Sebnitz, so a visit to the 2015 Dresdner Dampfloktreffen (steam loco 'meeting') took me back to Germany in the late spring of 2015 and enabled me to fill in that 600 metre gap.